Freshly Brewed Coffee from your Favorite Coffee Roasters? Choose the best coffee brands to buy freshly roasted coffee for your Bonavita. There is no denying that the smell of fresh coffee roasting is amazing, but without having your own coffee roasters at home it is unlikely you will get to partake in this sensory overload waking you from your slumber at 7am in the morning. The Bonavita 8 Cup Coffee Maker gives you the next best thing, allowing you to brew freshly roasted coffee grounds in a matter of minutes in the comfort of your home – quicker than the time it will take you to get dressed and out the door to your local café! The Bonavita is a great quality coffee maker – German engineered it has some qualities you won’t find in other machines in this price range! Such as the ability to heat the water to just the right temperature; water heads which allow the perfect amount of contact time between water and coffee grinds (meaning a better cup of coffee), stainless steel enclosed glass thermal eight cup carafe, and non toxic BPA free plastic components. 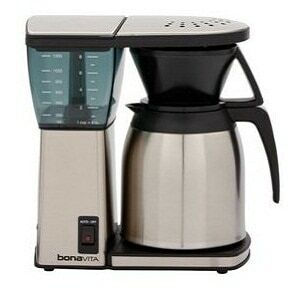 If you are looking for an affordable coffee maker to fit on your kitchen bench, the Bonavita is it. It can be hard to track down coffee brands that roast their own coffee on site and then sell to the public, but if you are going to use the Bonavita 8-cup coffee maker it is certainly worth tracking down reputable coffee brands and roasters who can provide you with a number of different options for your Bonavita. So how do you go about finding the best coffee to get the most out of your Bonavita coffee maker? Let’s get one thing straight right away – there is absolutely no comparison to a coffee made with fresh roasted beans. Good coffee is about the experience right? The aroma, the taste, the texture, how well it is made, the type of beans, the type of roasting process and the list goes on. But one thing is for sure, and that is a coffee made with beans that have recently been roasted beat any mass produced ground coffee you will find on the shelf of your supermarket. How can coffee roasters help me get the right brew in my cup? Coffee roasters know their coffee, and if you are only just starting out in the world of fresh coffee you may want to track down a roaster that does coffee cupping or coffee tasting sessions; by attending one of these sessions you will get to taste (and take in the smell of) various types of coffee. Your roaster will also be able to give you hints and tips on the flavors you might be looking for, and may even be able to provide you with sample sizes to try at home. If you are in the market for a great little coffee maker that produces lovely coffee from your local coffee roasters beans treat yourself to a Bonavita 8 cup coffee maker and take delight in the smell. For iced tea, put in as much water as you want and put 1 tea bag for every cup of water, or two, depending on how strong you like your tea. I make my iced tea this way. I make the whole pot 12 cups water, 12 tea bags and put it in my sun tea container and when cool I put it in the fridge.